The Navigation screen allows you to manage the structure and appearance of the navigation features of your site. The main menu appears in the Header and is the principal navigational aid on a website. There are two locations in the user interface (UI) where the main menu can be configured. The 'Main menu' button (1) provides access to the Main menu configuration screen. On this screen you can drag and drop page titles to where you want them to appear in the navigation structure. This option is recommended if multpile changes need to be made to the navigation structure at once. The menu link to a page can be configured on the 'Menu settings' tab in the page's edit mode. 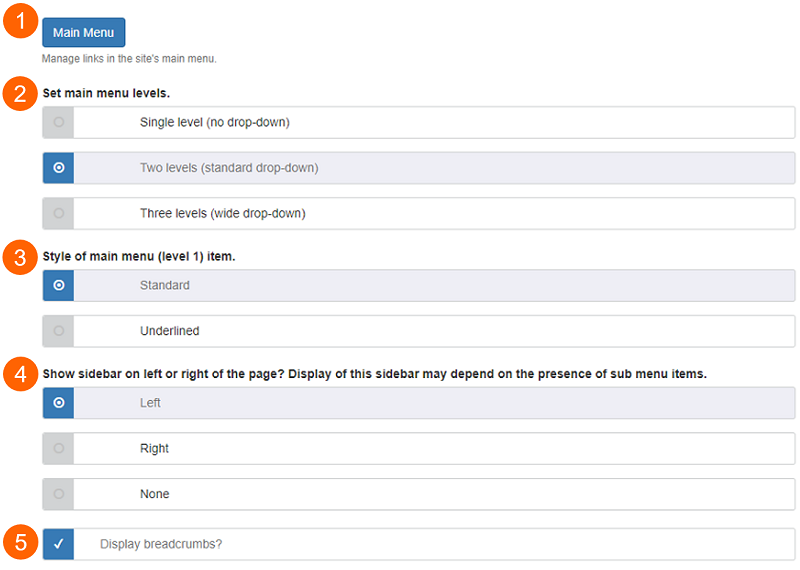 Setting the number of menu levels determines how the main menu in your site's header will behave. Only the top level menu items are displayed. Top level and second-level menu items (in drop-down menus) are displayed. 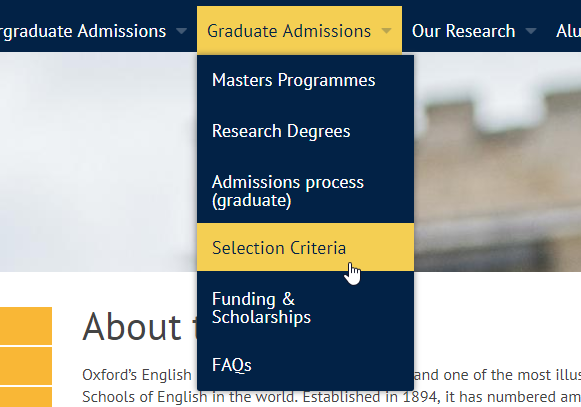 Second and third level menu items are displayed in a wide drop-down menu. Note: this option can only be viewed on the Navigation screen when 'Wide navigation' functionality is enabled on the site. If the 'Three levels' option is not visible and you would like to use it on your site, speak to the Web Platform team. Choose how top level menu links are styled. 'Standard' style uses background colour and foreground colour changes to indicate hover/focus and active links. 'Underlined' style uses a line below links. 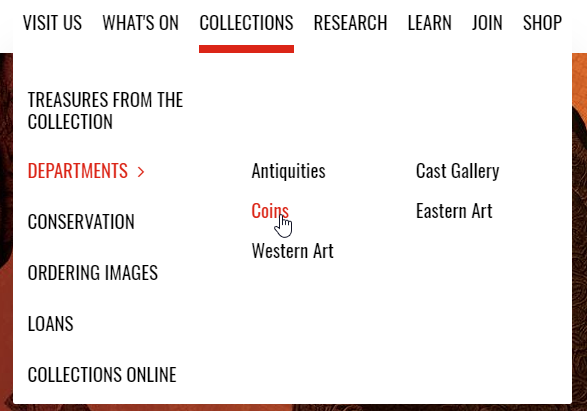 Output on a Mosaic site: Underlined menu link style. Note: capitalised text in the example is not determined by the link style. The sidebar menu provides a menu of links to sub-pages, and can only be used on Page content types; it is not available for Article, Event, or Person content types. In the screenshot below, the pages listed in the sidebar menu in bright orange (e.g. 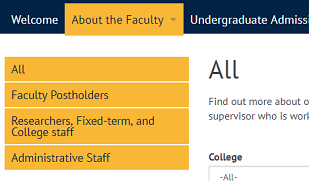 'News and Events'; 'People'; and 'Recent Publications') are direct sub-pages of the 'About the Faculty' page (second-level). The pages listed in pale orange are sub-pages of the 'People' page (third-level). Use the controls (4) on the Navigation tab to position the sidebar on the left or right of the page, or to prevent it from appearing on the site at all. When the sidebar is displayed, it is not positioned within any of the page regions in the way a widget is, instead, it sits outside of the page regions and displaces them either to the left or right, depending on where it is positioned. Breadbrumbs can be set to display or not display on pages. If breadcrumbs are enabled, they appear on every page on the site, and are positioned at the top of the main content area, above the page title. The pages listed in the breadcrumb is determined by the navigation structure, which can be configured in the Main menu screen, or the page edit mode. The font style used in the breadcrumb can be set using the advanced Font Management options. When the 'Display breadcrumbs?' checkbox is checked (Site Settings > Navigation tab), two checkboxes are displayed to allow top and bottom margin, respectively, to be added to the breadcrumb. When the 'Display breadcrumbs?' checkbox is checked, the 'Add top margin to site breadcrumb?' checkbox is checked by default.